I spend a lot of time on the computer, a lot of time painting and a lot of time writing and a lot of time drinking copious amounts of tea. If either of the two mugs shown are not available, my tea just doesn’t taste the same! The Campbell soup mug has been kicking around with me for a lot of years now. I bought it at a garage sale for about a nickel…lol. I have had the odd mug of soup in it, even sipped a few coffees but the main liquid for this mug is tea, tea and more tea. I find the Campbell soup logo to be comforting, a throw back from years ago when I was a kid and the world was a simpler place. Much the same way that Newfoundlanders love their Purity products. The other mug was a gift from a very special friend and now gets equal billing with the Campbell soup mug. The words mean a lot to me, the size is perfect and the handle fits my hand like a glove. 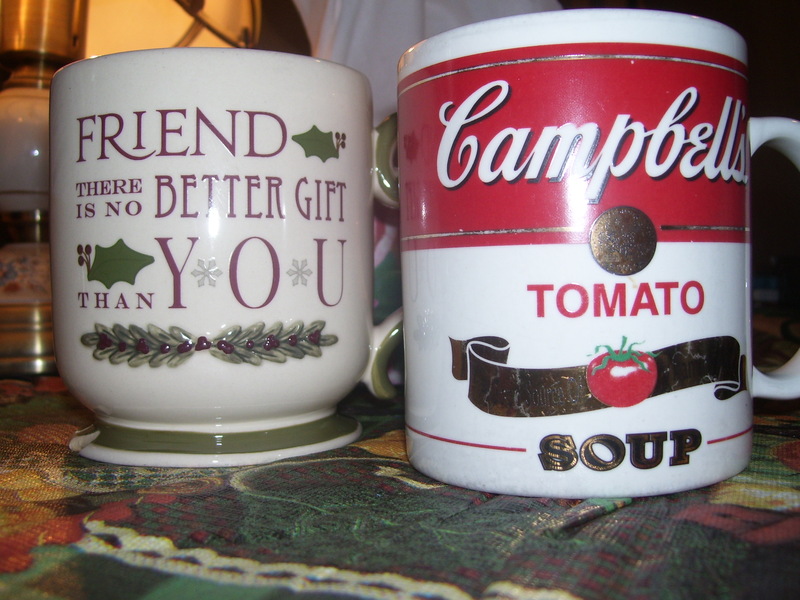 I do not offer either of these mugs to company but Pearce frequently grabs the Campbell soup mug and farms it out…lol. I don’t say anything out loud because I know I’d just sound petty. I want to be the reason they get worn out and chipped. They are like comfy old slippers designed for my comfort and my comfort only! SHOW ME YOURS, let’s have some fun. Don’t forget to tell me why it’s your favorite because every good mug has a story behind it.